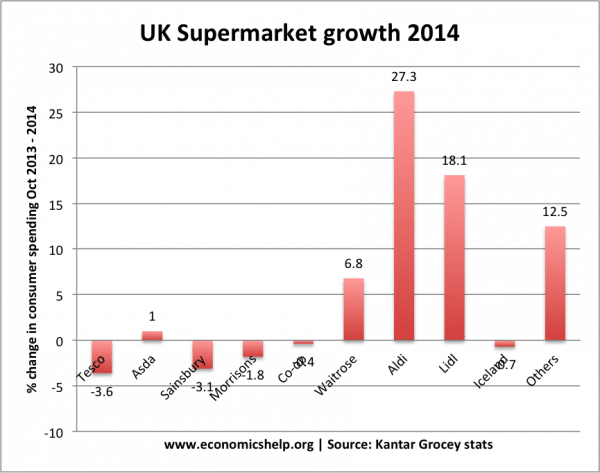 The UK grocery market has become increasingly competitive in the past few years. 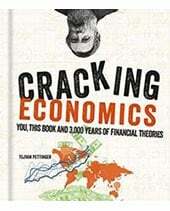 It is a good example of an oligopoly becoming more competitive. Certainly, the growing strength of discount giants like Aldi and Lidl have really shaken up the market and diluted the cosy oligopoly previous enjoyed by the likes of Tesco and Sainsbury. To further add interest, Pound shops are also gaining market share and nibbling away at the margins of the big supermarkets. For consumers, it is largely good news with lower prices, lower profit margins and a raft of incentives from supermarkets trying to hold onto market share. The big three – in particular, Tesco and Sainsburys are suddenly having to pull a halt to ambitious expansion plans and in Tesco’s case have been left red-faced by profits falling short of profit forecasts. Why are Supermarkets becoming more competitive? The supermarket industry is fairly contestable. There are few limits to opening a new superstore. Also, the shift to smaller, local convenience stores has made it even easier to set up new local supermarkets – rather than big, out of town supermarkets. 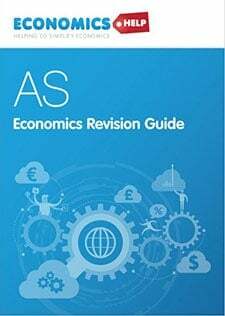 It is true there are significant economies of scale in purchasing, distribution and marketing, but even a relatively small supermarket chain like Lidl / Aldi seem to be able to exploit great economies of scale from their relatively small market share. It is not like the car industry where the minimum efficient scale is a much bigger share of the market. The past few years have been particularly tough for the hard-pressed British consumer. In the past few years, inflation has consistently been higher than nominal wage growth – causing the most persistent fall in real incomes since before the war. In such straitened times, it is unsurprising that consumers have become more sensitive to price, seeking out bargains in Pound shops and budget, no-nonsense supermarkets like Lidl. The great recession is not a good time for supermarkets like Sainsbury and Tesco who have relied on a higher price markup. Often supermarket price wars are carefully selective, but this time the price wars really do appear to be more sustained. The price of a basket of goods is the same as last year. Generally, this increased competition is good for consumers. 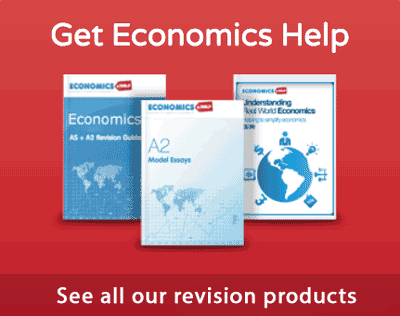 There are strong downward pressures on prices, which are leading to lower cost of a typical basket of goods. Incentives to retain consumers. In a battle to retain customers, supermarkets are offering a range of special discounts (e.g. spend £30, get £5 off). On a personal note, I used to only get these from Tesco, now they all seem to do it. If you’re really keen to chase every coupon, there are even greater savings to be had. Consumers are also facing a much greater choice. The number of supermarkets has increased, especially with smaller, more convenient – mini supermarkets. Now many shoppers face a greater choice of supermarket brands, rather than facing a choice of Tesco v Sainsbury or Tesco v Asda, a range of supermarket brands are available. Less fussy about branding. It might be the case that the success of Aldi, Lidl show consumers are less fussy and have less brand loyalty than previously. See – the growth of private label brands. 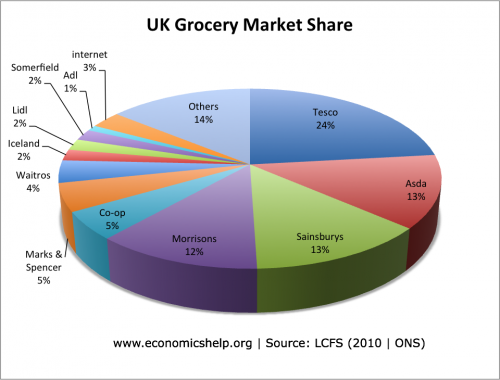 This graph from ONS data uses slightly different definitions of a supermarket. 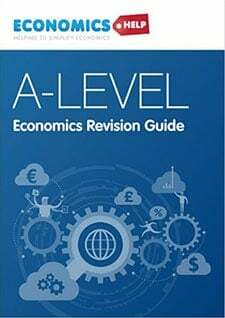 This entry was posted in A-Level, business, economics, links, microeconomics and tagged microeconomics. Bookmark the permalink. Nice blog post. 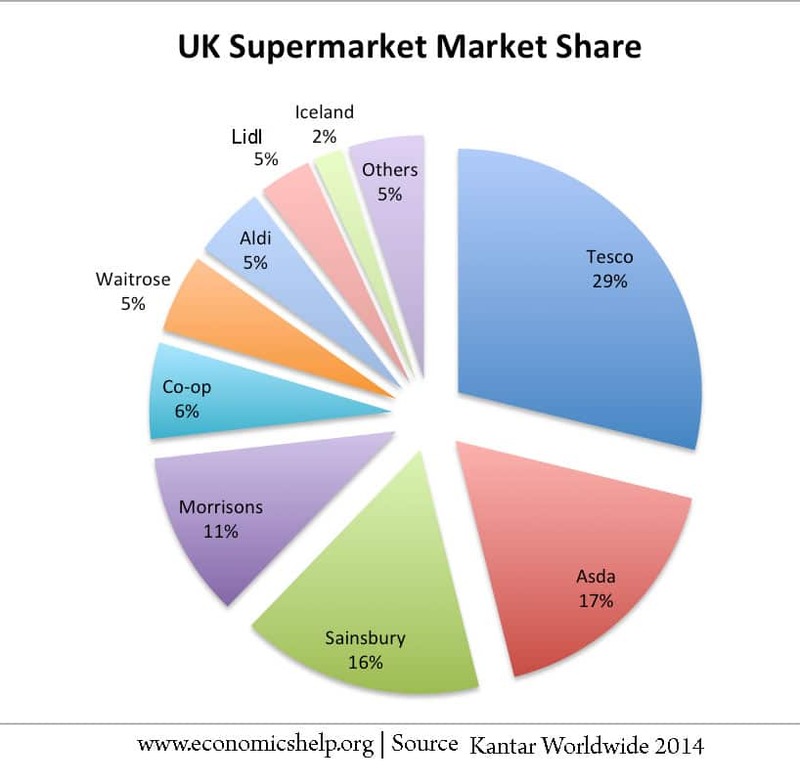 Good to read about market share in the UK supermarkets. Yes, there is huge competition amongst the supermarkets. Cool article; from my understanding customers gain most of the benefits from these competition among supermarkets. But just wonder how supermarkets try to remain competitive? Are they importing goods from developing country? Great post because I like the overview, especially being reminded that in 1971 Tesco had a market share of only 7%. What a phnomenal growth in 40 years. 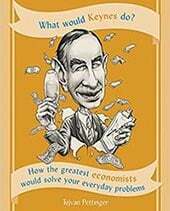 I remember Tom Vyner, then CEO, reading a newspaper article at a Sainsbury’s conference for internal category managers that said’, Beware of the discounters’ and then told us that the article was written in 1923. I bet he wished he had taken more notice of the incoming discounters! How can you talk about competition? There is no competition. It’s oligopoly!